Slapped cheek disease is an infection caused by the B19 virus (sometimes known as fifth disease), and although it is an infection that can be caught at any time, it reaches its peak in April and May. It is an airborne virus that is spread similarly to cold and flu. Increased hand washing prevents spreading. Fortunately many adults in the UK have had the disease even if they are unaware. It is more common in children but adults can contract the disease. 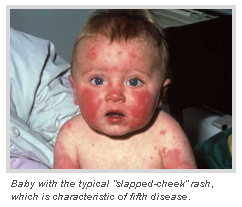 Slapped cheek disease can look quite dramatic due to the angry, red rash that is prevalent over the face, although it is important to realise that once the rash is evident, you are no longer infectious. Fortunately this disease is normally short lasting with mild flu like symptoms. You may suffer a headache or a fever for a few days prior to the rash developing and sometimes, mainly in adults, mild joint pain and stiffness can occur which can be eased by non-steroidal anti-inflammatory drugs such as brufen. You may also have a sore throat, itchy skin, upset stomach and feel tired. 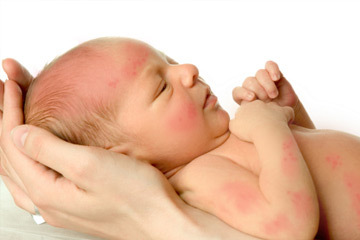 The rash usually becomes noticeable three or four days after the initial symptoms start. After a few days, the rash will spread to the chest, stomach and limbs and may cause some mild discomfort and itching. 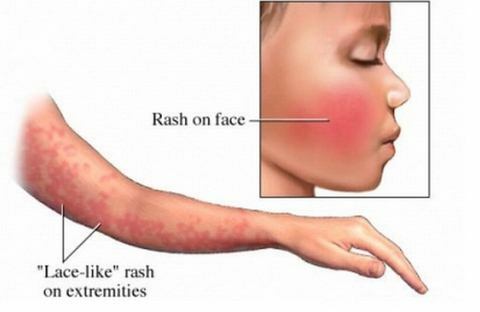 The rash should disappear after a few days although occasionally, it may last a few weeks. Once you have been infected (usually in childhood) you should develop a lifelong immunity. The condition is usually diagnosed upon the classical rash on the cheeks although in some cases it may be wise to have a blood test to test your immunity. Although there isn’t usually any lasting complications from the disease, the illness can become more serious if you suffer from anaemia such as sickle cell or beta thalassaemia. It can also be serious in people with weakened immune systems such as those carrying the HIV infection or who have received chemotherapy or who have leukaemia. Also it can be more serious in pregnant women who have no immunity. If you are under 20 weeks pregnant and become infected with the virus, you have an increased chance of miscarriage or stillbirth (3-10%). You also have a 1 in 3 chance of passing the virus to your unborn baby, this then increases the risk that your baby will develop severe anaemia in the womb. In rare cases this can lead to heart failure in your baby or a condition called hydrops fetalis which is an abnormal collection of fluid inside the tissue of your baby. If you are pregnant you should try to avoid contact with Parvovirus B19. If you believe you have been in contact with an infected person, visit your midwife or GP who will perform a blood test to check your immunity. If you develop the infection, you will be offered extra ultrasound scans during your pregnancy to assess the baby’s well being. If your baby is found to be anaemic, they may be treated with a blood transfusion. There is no evidence to suggest that Parvovius B19 causes birth defects.